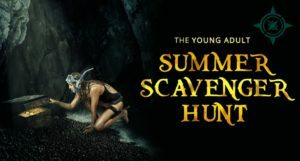 Seems you’ve stumbled onto my stop for the YA Summer Scavenger Hunt! 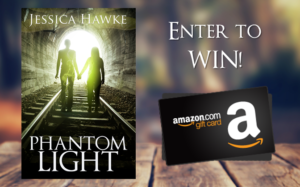 Hello there – I’m Jessica Hawke. I like cats, superheroes, and writing books. 😉 Thanks for stopping by! If you’re new to me, you might be excited to find out I have a new book coming out in about a week! 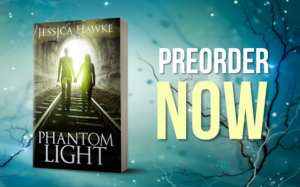 It’s the fourth book to be published in my Phantoms series, but it’s a prequel! So even if you’ve never read one of my books, you might enjoy checking it out. What would you sacrifice for the ones you love? When Valerie Young wakes up from a horrific accident to a world gone gray and cold, she wants to believe anything but the truth of what happened. But as she struggles to accept the dreaded d-word, time is slipping away for her to move on to the afterlife. When she realizes her younger sister has been irreparably altered by the accident, Valerie must choose between a chance at peace and the cold reality of existence as a restless spirit. Hope that sneak peek piqued your interest! Obviously I can’t tell you EVERYTHING about the book, but if you read it, you’ll find out what happens to Valerie and her sister, the heroine of the series. Don’t forget to continue your journey! If you need it, you can refer to the rules and instructions HERE after you enter my giveaway below!